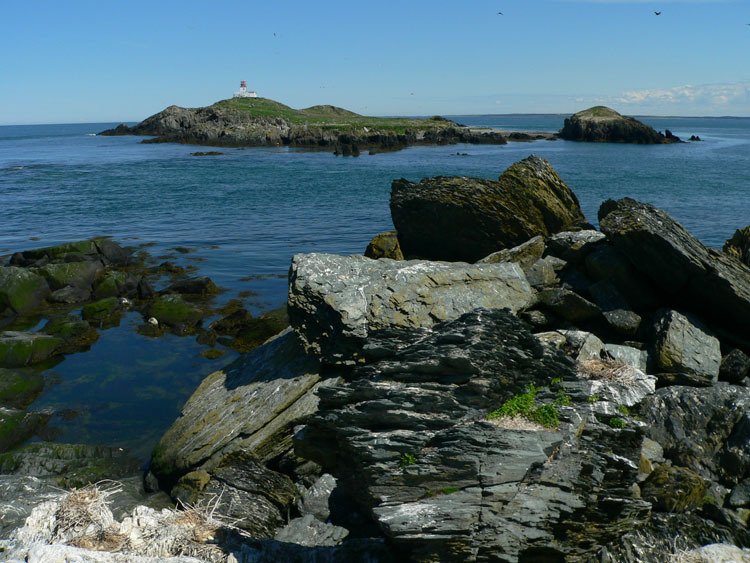 The following is a synopsis of the tern status in southwest Nova Scotia for the 2006 nesting season. My "tern" work and observations deal primarily with the tern colony on The Brothers. 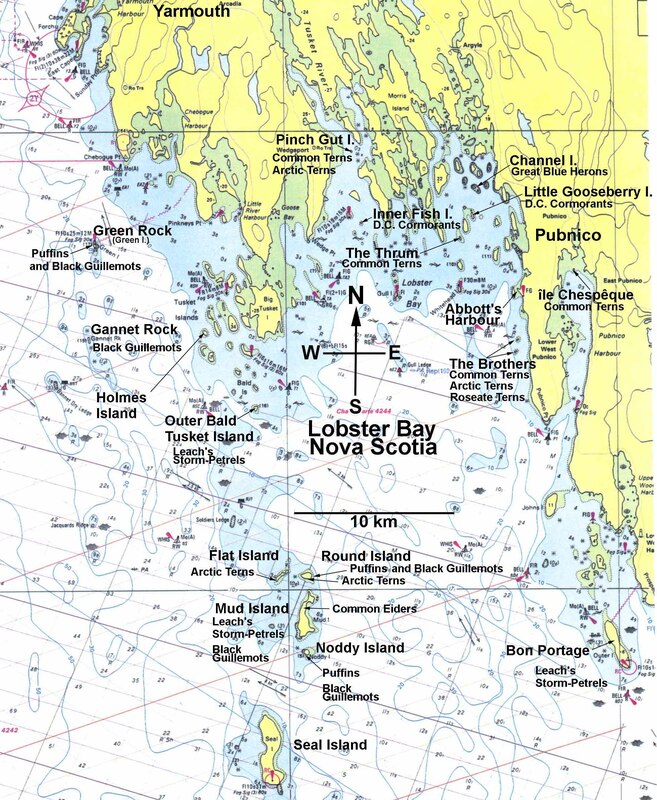 These two tiny islands are located about 1 km offshore from Lower West Pubnico in Yarmouth County. 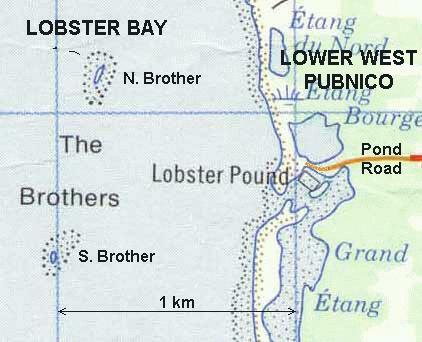 Total tern nests on The Brothers was 616 (only on North Brother in 2006). This was up from 445 in 2005; down from max of 880 in 2001. 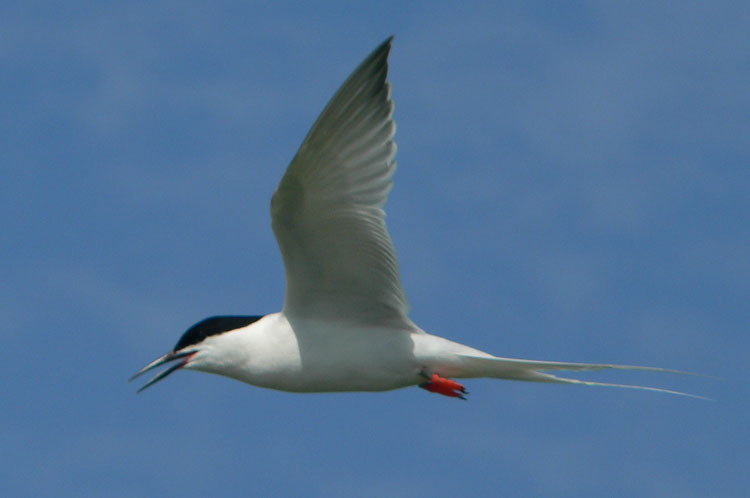 There were 67 Roseate Tern nests on The Brothers in 2006. The maximum number of ROST chicks documented at any particular time was on June 27, 2006, when 51 were located; most of them within centimetres of where they were hatched. Only two of these were found dead. A few more were found dead at later dates, however, all in all, I believe ROST chick mortality was low. 27 Roseate Tern chicks were banded on July 10/06 on N. Brother. I believe this to be the highest number of ROST chicks to have ever been banded on The Brothers in any particular season. One field-readable Roseate Tern leg band, "1L over 44", was read on N. Brother on July 16, 2006.� This was on an adult bird previously seen on N. Brother in 2002. 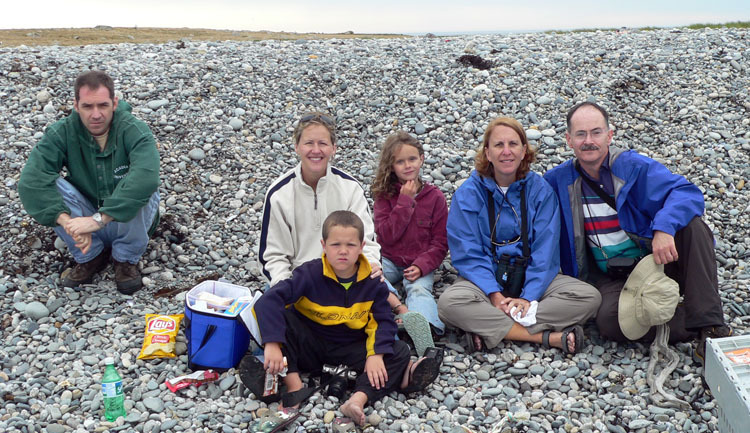 It had been banded as a chick on June 30,1999 at Petit Manan NWR, Maine. Very little predation in 2006. No Mink in 2005 and 2006. 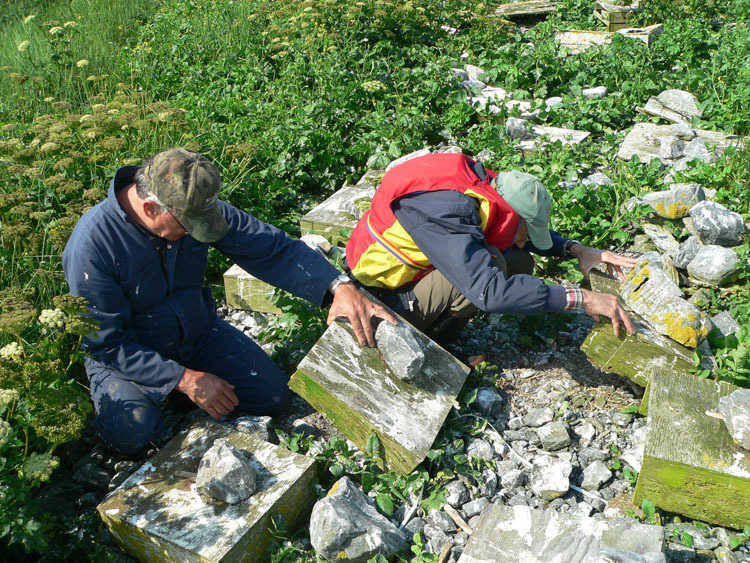 Four Great Black-backed Gull nests were removed from The Brothers in 2006 - 3 from S. Brother and 1 from N. Brother. 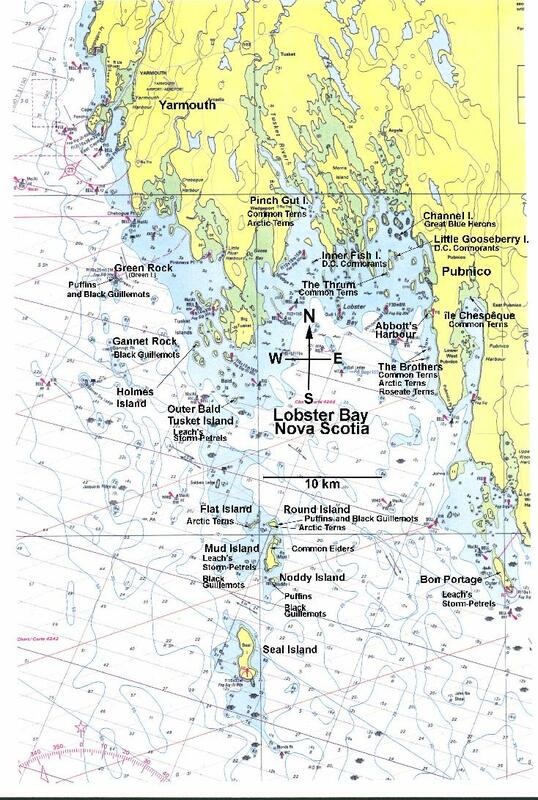 The following is a chronological listing of my 2006 work with terns in general, of the Lobster Bay area, but especially with the Roseate Terns of The Brothers. The report also includes tern observations from other local residents. April 26, 2006 - First visit to The Brothers in 2006. The observation platform which had been dismantled in April 2005, from the fear it had been used by predator owls as a lookout perch was reassembled. There were as many owl-killed terns in 2005 as in previous years. We also cleaned up the mostly plant debris among the nesting boxes. Crew: Israel and Rémi d'Entremont. 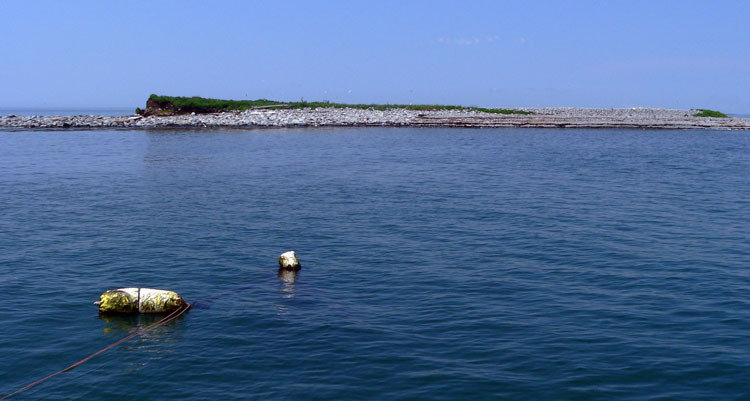 May 5, 2006 - Lobster fisherman, Robert Nickerson reported the first tern seen at The Brothers. May 5, 2006 - A visit to N. Brothers accompanied by Margie Rogers. We moved the observation platform to its final placement and weighted down its base with rocks so it would not blow away. We also attached its ladder. May 15, 2006 - I was on The Brothers this morning. I destroyed two GBb Gull nests the South Brother. One contained 2 eggs the other was empty. Only about 6 terns above S. Brother and about 20 above N. Brother. Most of the terns were Arctics. There were some Commons mixed in, however, we could not locate any Roseates. This is the time the Roseates usually begin to arrive.One of the lobster fishermen told me Thursday or Friday there were hundreds of terns above The Brothers when they pass by the islands early in the morning. By mid-morning, most of the terns have disappeared from the nesting islands but are likely dispersed in the area and just not settled yet. Crew: Israel d'Entremont and Margie Rogers. May 18, 2006 - N. Brother. Fewer terns than expected. Perhaps 75 in total. Only one pair of Roseate Terns. These were observed in high flying courtship behaviour; one of them was also seen on the island, sitting on a washed-up piece of wood. May 25, 2006 - N. Brother. Possibly 200 to 300 terns. We could see only one Roseate Tern. Lots of courtship behaviour. We did not land on the island, but observed from the boat for 20 minutes. We then went to Île-aux-fraises (a.k.a. Green Island) where I destroyed a single Great Black-backed Gull's nest containing two eggs. There were only about 50 terns there. No Roseates were seen there. There were as many as 15 Common Eider nests in the island. A few eider nests appeared to have been depredated by gulls. Next stop, Green Rock (a.k.a. Green Island). We counted 10 Razorbills among the Puffins, coming out of the small rocky islet to the south-east of the main island. 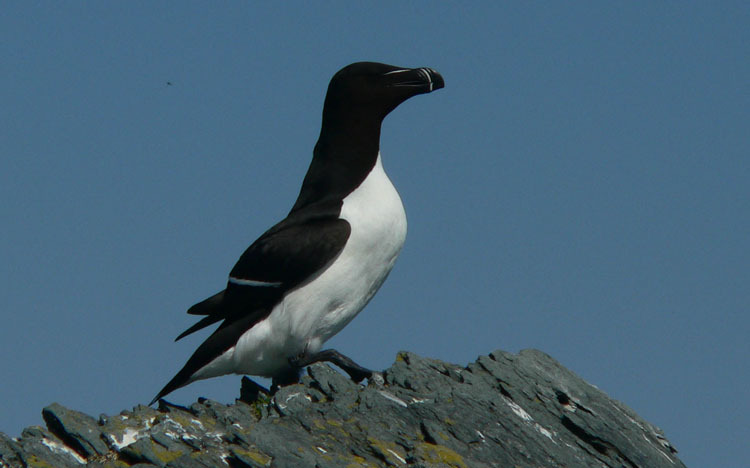 We also found two Razorbill nesting locations each containing a single egg. No Puffin nests/eggs were located. There was also a Double-crested Cormorant colony on this islet. Numbers: 10 or 11 Razorbills (there was a single Razorbill with the Puffins below the lighthouse, on the other side of the island), 35 to 40 Puffins, perhaps 40 Double-crested Cormorant nests, one Great Blue Heron nesting midway on the rocky ledge not far from the lighthouse. 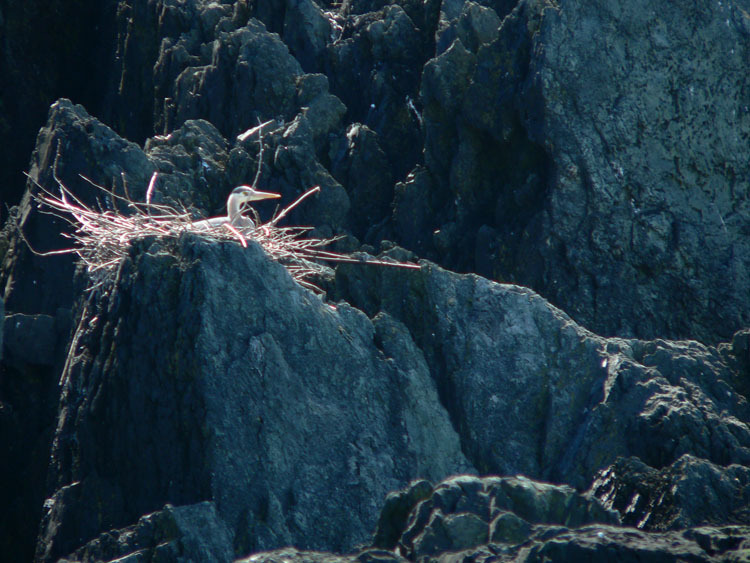 The heron nest was certainly in a strange location. Previous to this, I had only seen GB Heron nests in spruce or fir trees. Crew: Israel d'Entremont, Rémi d'Entremont, and Margie Rogers. May 30, 2006 - N. Brother. Lots of nests and tern activity. A quick count of about 200 tern nests including at least 12 Roseate Tern nests! I destroyed one Great Black-backed Gull nest containing two eggs. We found a Common Eider nest containing 5 eggs under a wooden pallet. From the boat at anchor we could see two Roseate Terns with leg bands. It was not possible to read them. 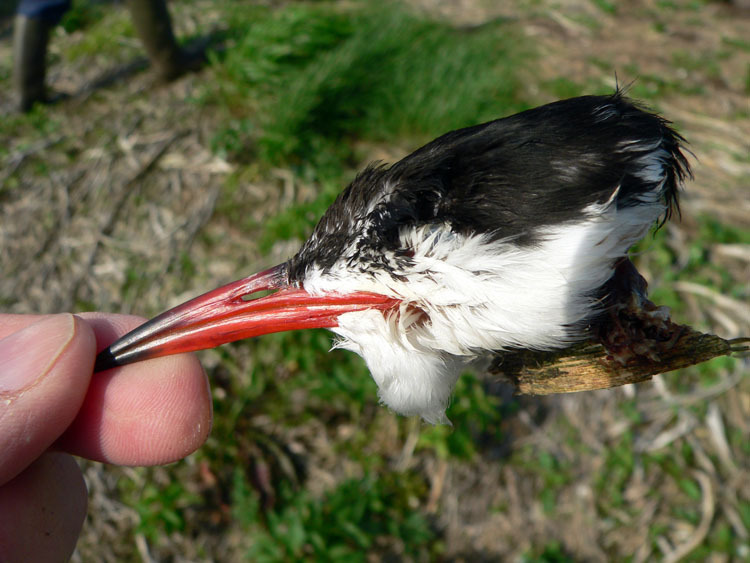 The severed head of a Common Tern was found on N. Brother. I would assume from owl predation. I ran over the line to the permanent anchor at N. Brother, severing it. I will see if I can reconnect it with SCUBA, possibly later this week. June 2, 2006 - N. Brother. I replaced the mooring line using SCUBA. The old rope was covered with mussels and other crustaceans and had sank to the bottom. Lots of tern activity on the island but we did not land. Light rain shower. June 6, 2006 - N. Brother. I brought three members of the Roseate Tern Recovery Project of the Bluenose Coastal Action Foundation, Mahone Bay, NS, for some hands on exposure to an active Roseate Tern nesting colony. While I had the group with me, we made a quick nest number estimate. The findings: 348 tern nests (47 were Roseate Tern nests). I was very pleased with the numbers, being I should get still better numbers when I do the official nest count next week. I also expect many more Roseate Tern nests. There were no gull nests to destroy on N. Brother. One Great Black-backed Gull nest containing two eggs was destroyed on S. Brother. There were no terns nesting on S. Brother. Crew: Chris Wessel, Erin Balser and Jeffrey McCrossin. June 9, 2006 - N. Brother. A quick check of the island accompanied by Melvin Surette and Doug Sheepway. All was well. June 13, 2006 - Nest census day on N. Brother. We counted 616 tern nests on The Brothers. 60 of these were nests of the Roseate Tern. I expect to find more RT nests in the coming week or two. Only one tern chick was found; the one day-old Common Tern chick was in a nest along with two yet unhatched eggs. In another nest, one tern egg may have been eaten by something or there may have been another chick somewhere nearby; we found only half of an empty egg shell. There are now 3 Common Eider nests on N. Brother. The eggs in one of the nests appeared cold. Other than that, all appeared well on the island. Crew: Rémi d'Entremont, Margie Rogers, and Melvin Surette. June 27, 2006 - N. Brother. Due to some personal health concerns and some miserable weather over the previous two weeks, I was not able to visit The Brothers as I had wished. Some good and some bad news to report. The Good: There are now 66 Roseate Tern nests on North Brother. 51 Roseate Tern chicks were located; most of them within centimetres of where they were hatched. Roseate Tern chick mortality was very low with only two found dead. The Bad News: Common and Arctic Terns have suffered substantial chick mortality which appears to be weather related. We have had very heavy rains recently with little or no sun. I expect the fact that most of the Roseates nest under shelter is the reason why they were spared this fate. A rough estimate of the Common and Arctic Tern chick mortality is likely in the 25 to 35 per cent range. 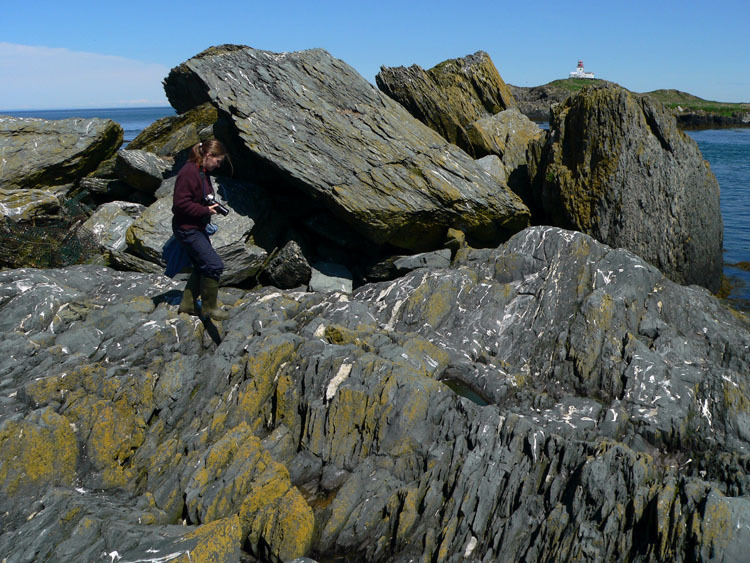 We found no adult tern mortality or predation on N. Brother and no sign of Mink activity. Another Common Eider nest with 4 warm eggs was also found. July 4, 2006 - N. Brother. One more Roseate Tern nest to add. The total is now 67. We located 17 RT chicks in total. Five of these were dead. A few more eggs had hatched and the missing chicks were assumed to be hiding in the vegetation. The island was very busy with tern activity; lots of feeding going on. There were no signs of predation by Mink or anything else; no dead adult birds were found. Crew: Israel d'Entremont and Rémi d'Entremont. July 10, 2006 - N. Brother. Great day for banding Roseate Tern chicks. 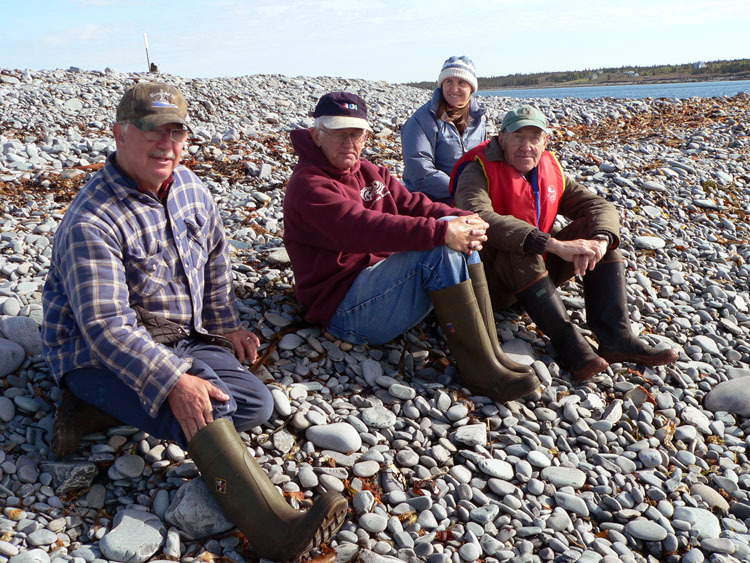 Canadian Wildlife Service (CWS) biologists, Andrew Boyne and Julie McKnight arrived on the island with Nigel D'Eon and me. We located and banded 27 Roseate Tern chicks. I believe this to be a record number for The Brothers. Most of the chicks were over two weeks old and expected to soon fly from the island. July 16, 2006 - N. Brother. I went on the island to read adult ROST field-readable leg bands. Only one adult ROTE was seen with leg bands and I was able to read the four characters. They were "1L over 44". The three tern species were bringing in mostly Herring. July 19, 2006 - N. Brother. Quick visit. All was still well on N. Brother. We located another unbanded Roseate Tern chick about 2 weeks old. We saw a few more banded chicks. July 28, 2006 - N. Brother. I was hoping to be able to read more leg bands on this visit. After a half hour in the observation blind, I realized the Roseates were no longer feeding chicks in the nesting area. All the feeding action was along the shoreline, and with the tide being low, the birds were too far for reading leg bands. We could see banded chicks in the distant. The air was foggy. Crew: Brandon Spencer and Nigel D'Eon. August 1, 2006 - On our way to check out the Puffin numbers at Noddy Island we stopped by N. Brother to observe from the boat. Roseate and other tern chicks were still being fed along the shore of the island. 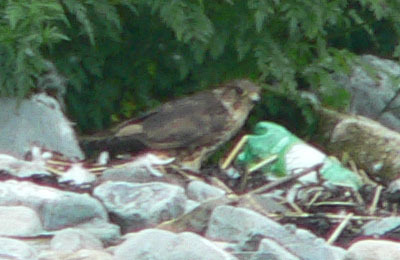 My brother, Roland, brought our attention to a Merlin on the higher beach which was taking apart what we assumed to be a tern. It was still there eating away as we continued to Noddy. At Noddy Island was the greatest number of Puffins I have ever seen there. We estimated there to be about 100. There were also about a dozen Puffins at Round Island. We stopped at Mud Island to do a little birding and exploring, and to eat our lunch before heading back to Abbott's Harbour, West Pubnico. We had a great trip. Crew: Roland D'Eon, Tina d'Entremont, Adam Harris, MacKenzie Harris, Paul's wife and Paul d'Entremont. August 10, 2006 - Motored to N. Brother with my brother, Roland. There were still a few Roseate and Common terns present with fledged chicks.